Big cheers for Morag Colquhoun. It's a great start to the day for Morag Colquhoun who passed her driving test this morning. 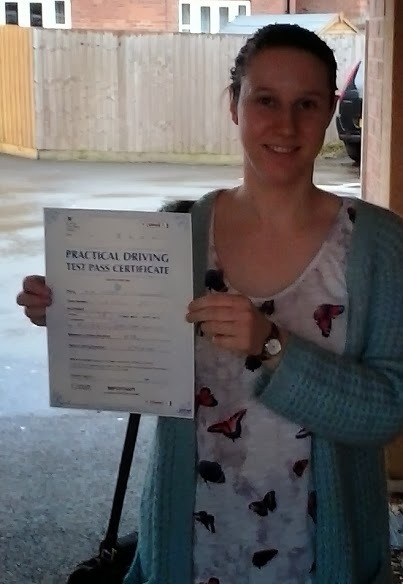 She looked a bit shaky as we made our way to Colwick test centre in Nottingham but she managed to conquer her nerves and put in an excellent performance. Morag's lessons were a bit different from most as she brought her infant son Archie along. He sat gurgling nicely in his baby seat while mum learned to drive. A lot of young mums don't know that it's OK to bring their child to lessons. No need to be worrying about child care. Remember that you are learning to drive in the real world, not just to pass a test. If a child starts to make a noise or cry then it can be a stressful situation as well as a big distraction. It's far better to get used to this under supervision than to deal with it driving alone after the test. If young Archie did start to cry or become uncomfortable then we just pulled over in a safe place and sorted him out. Just as you would in real life. Morag is now better equipped for the road and can deal with driving around with a child passenger. Well done Morag and all the best for the future. Bring your child to driving lessons.